From the word tension (a force applied to a continuous web of material in a machine), a Tensioner is a device that is used to apply force to an object to retain the tension. It regulates the tightness and movement of a thread in an object. 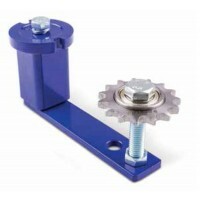 Power Transmission systems use Tensioners to keep V Belts and Roller Chain tight within a drive. The tensioner is made up of two parts: a Tensioner Arm and a Tensioner Sprocket or Tensioner Roller. A Tensioner Sprocket is a circular steel component, with teeth-shape cuts around the edges. Its function is not to drive or be driven by a chain but to guide and maintain its movement. A vehicle such as a car is a good example of a machine that uses Tensioner Sprockets. The chains inside the vehicle provide an assurance that the driving pulley will be tight enough and will not become loose. Can't find what you're looking for? – Contact us.